As part of our overall approach to improving communications and finding different ways to engage with the membership, we have today launched two new snapchat accounts for the National Union and the General Secretary. We also plan to have our own snapchat filter in place for CWU Conference. Please share this information with members in your branch areas. Nominations for the above positions closed at 14:00 on 28th February 2017. Please find below a list of accepted nominations and respective nominating branches. 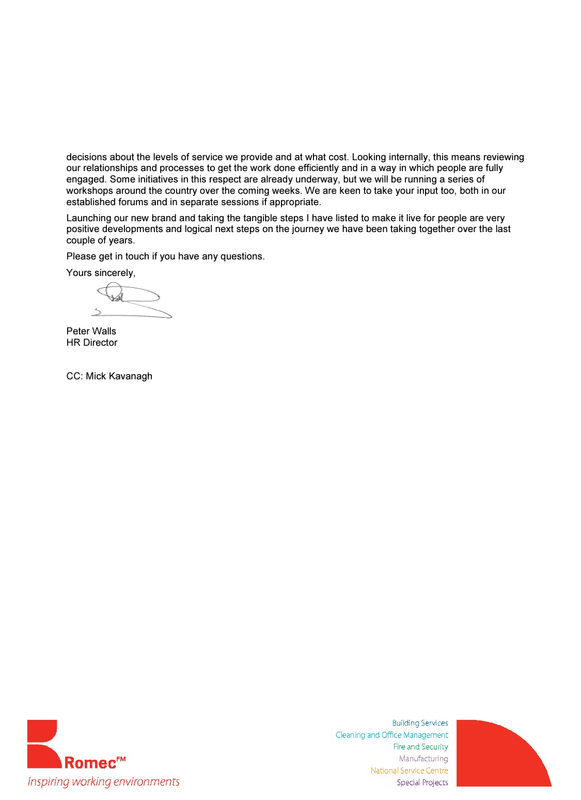 CWU SENIOR DEPUTY GENERAL SECRETARY – Cont. Any enquiries regarding this Letter to Branches should be directed to Senior Deputy General Secretary for the attention of Peter Metcalfe on 0208 971 7368, or pmetcalfe@cwu.org. Earlier this month, we issued LTB 087/17 which gave details of the important OUR NHS March and Rally which takes place on Saturday 4th March 2017. We are writing again to encourage as many CWU branches as possible to be in attendance at this event. We have been asked to assemble, within the ‘Trade Union block’ at Tavistock Square in good time for the commencement of the march to Parliament which will lead off at midday. The CWU position will be identified clearly by the presence of our giant balloons. Given recent press coverage and the heightening risk to the future of our NHS, it really is important that CWU members and activists get involved in this demonstration and show our solidarity and support for the NHS and for the members and unions working in the Health and Care Sector. Please see attached the February 2017 edition of Safe and Well newsletter with contributions from our USRs and field teams. It contains news around a Near Miss, Exchange Safety & Vehicles. Other focus is on MEWPs as a result of a recent incident, articles from the field, updates around hot sites and round up on Waste Education – which is also a good news story this month. There is a myth buster on ladder checks and a roundup of publications for the month. There is also a reminder where to find guidance on weather. As you may know Youth Conference carried two motions this year directly relating to mental health, especially suicide amongst young adults. Mental Health issues within the workplace is still very much a silent problem and often reps are ill-equipped to deal with the many situations that arise directly as a result of some mental health occurrence such as depression, stress or suicidal tendencies. Guide a person towards appropriate professional helpWhat will Participants learn? MHFA won’t teach participants how to be a therapist, but once they have completed the two day course they will be able to say they are a Mental Health First Aider. Reduce the stigma of mental health issues.The Adult MHFA course usually takes place over two full days. Everyone who attends the course will receive a copy of the MHFA manual and workbook, which are both excellent support resources. When participants have completed the course they will receive a certificate to confirm that they are a trained Mental Health First Aider. The sessions will be a mix of presentations, discussions, and group work activities. The instructor will provide a safe learning environment and are trained to support participants throughout the whole course. If participants don’t feel comfortable joining in certain parts, then there is no pressure to. Places are limited to 20 (the course may be run again if there is interest). Branches are asked to encourage their Branch Youth Officer or Youth Rep to take part. The cost of the course will be paid for by the national youth budget, but branches are asked to cover travel, subsistence and accommodation costs (if required) – no accommodation will be booked by head office. An application form is attached and should be completed by the branch/participant and emailed back to Jo Thair (jthair@cwu.org) by close of play on Tuesday, 14th March 2017 please. Queries on this LTB should be directed to Jo Thair at CWU Head Office via email: jthair@cwu.org or by telephone 0208 971 7487. The British Medical Association (BMA), have notified the Health, Safety and Environment Department that they are organising a Mental Health Conference for Health and Safety Professionals on Thursday May 11 2017, 09:15 – 17:00 at BMA House, London WC1H 9JP. There is no final agenda or details as yet. Healthy Work and Tim Marsh are delighted to present this one day event at the BMA, on the subject of proactively managing mental health and wellbeing in your organisation and the event aims to provide those attending with both the theory and practical tools to take a programme forward. The conference features Alistair Campbell as keynote speaker and a range of industry experts including psychologists including Tim Marsh and Sharon de Mascia, MHFA, HR expert Pam Loch and Senior Industry leaders from organisations already successfully implementing programmes in their organisations such as Clive Johnson, Karl Simons and Judith Grant Royal Mail Group Head of Health. This conference is brought together in partnership with BMA, Acre, Barbour EHS, British Safety Council, IIRSM and MHFA for England. Professor Tim Marsh and Sharon de Mascia are two well-known psychologists speaking at this one day event which takes place on May 11 at the BMA in London. Tim will address the “what is mental health” question and Sharon will demonstrate how to make the business case for mental health through work she has done with organisations in this area. This is not a cheap event! However IIRSM members of which, a number of CWU Safety Reps are, qualify for a discount. Special IIRSM member’s rate is £249 and standard rate is £295. IIRSM Members need to use the code: MPMH and Bookings need to be made by Thursday 16 March. Derby Magistrates’ Court heard that on 02 July 2015 the worker was unloading wooden furniture frames at one of their upholstery sites, when a worker was struck by an unsecured furniture arm which fell from an unstable load. The impact knocked the worker unconscious and he suffered serious neck and head injuries. A Health and Safety Executive (HSE) investigation identified fundamental and systemic failings in the company’s health and safety management systems which is far from what would be expected from a company of their size. The investigation found that DFS failed to adequately manage the risks of heavy loads being moved between manufacturing sites. The court heard the company also failed to supervise the work taking place with a number of near misses being reported from unsecured loads. The significance of this case is the clear warning to all large employers such as Royal Mail and BT. New Sentencing Council Guidelines to the Courts came into force in 2016 for Health and Safety Offences, described as the most dramatic change to health and safety legislation since the introduction of the Health and Safety at Work Act in 1974. Under the guidance large organisations that have been convicted of the serious offences, where they have flagrantly breached the law and created a high risk of serious harm, or where serious harm has actually been caused, can expect to receive a fine proportionate to the seriousness of the offence and to their financial means. For some time there has been concern that penalties imposed for health and safety offences and corporate manslaughter offences, particularly on large organisations, were too low and the approach to sentencing in the courts inconsistent. It is mandatory for courts to follow the guidelines for all sentences passed after 1 February 2016, regardless of whether or not the offence took place before that date. This heralds the start of an era where sentencing in health and safety offences will increase dramatically in order to have a real economic impact. Higher fines will also carry significant commercial and reputational consequences. Tough new sanctions will be a timely reminder that standards in health and safety management cannot slip. The new guidelines are also likely to result in an increase in custodial sentences for individuals who have committed a health and safety offence. 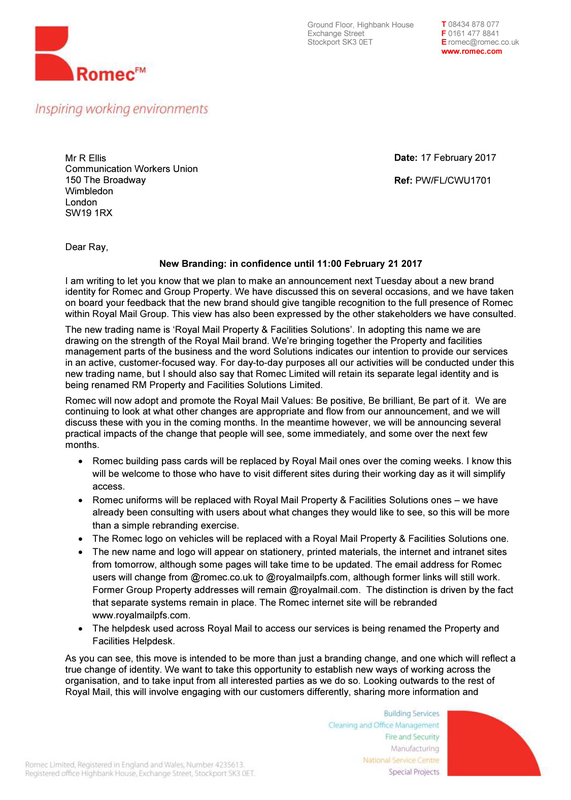 We attach a letter regarding a rebranding of Romec and Royal Mail Property which is being announced at 11 am today, 21st February. The integration of Group Property and Romec has been proceeding since Romec was brought back under full Royal Mail ownership in April 2016. To reflect the combination of the Property and Facilities Management parts of Royal Mail the new trading name is Royal Mail Property & Facilities Solutions. Romec Limited will retain a separate legal identity as Royal Mail Property & Facilities Solutions Limited. The union has been consistent in strongly arguing for a new identity which clearly reflects the place of Facilities Management within Royal Mail and we have welcomed the rebranding as a visible demonstration of this. • Romec building pass cards will be replaced by Royal Mail ones which will simplify access for mobile cleaners and engineers. • Romec uniforms will be replaced with Royal Mail Property & Facilities solutions ones. Users are being consulted on changes to the uniform. • The Romec logo on vehicles will be replaced with a Royal Mail Property & Facilities Solutions logo featuring the Royal Mail crown. • The new name and logo will appear on stationery, printed material, internet and intranet sites from today. The email address for Romec users will change to @royalmailpfs.com and the Romec intranet site will be rebranded http://www.royalmailpfs.com. • The help desk is being rebranded as Property and Facilities helpdesk. Royal Mail and the unions have been agreed in our discussions that we want a true change of identity – both in the relationship between Royal Mail Property and Facilities Solutions and the rest of Royal Mail and in industrial and employee relations internally. CWU reps in Romec will be fully involved in dialogue with the employer to shape Royal Mail Property & Facilities Solutions as a successful part of Royal Mail Group. All enquiries regarding the content of this LTB on Romec Cleaners should be addressed to the Outdoor Department, quoting reference 120. Email address: outdoorsecretary@cwu.org.